The Halloween traffic at my house was rather slow tonight and, as a result, I have a huge bag of candy that I will be enjoying over the next few weeks. My neighborhood is hard to predict. 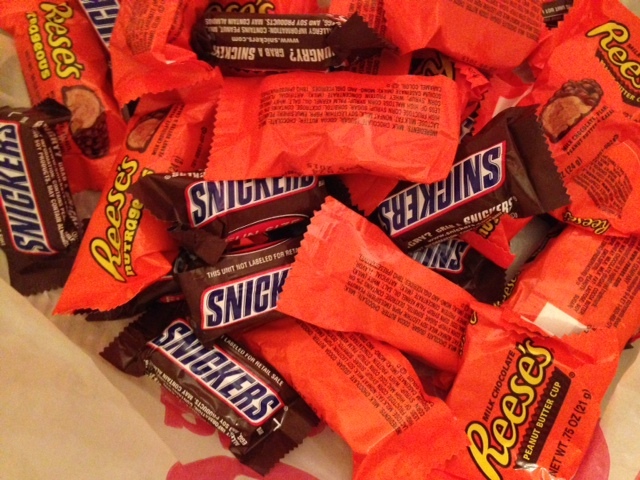 Some years, like last year, I ran out of candy and had to run to the neighborhood CVS to resupply. Other years are like this one, with no more than a dozen little ghouls and goblins. Usually, bad weather keeps the numbers down, but this year the rain held off until after 9 pm, and while it was colder than last year, the temperature was pretty average for this time of year. Michelle Knudsen’s Evil Librarian. 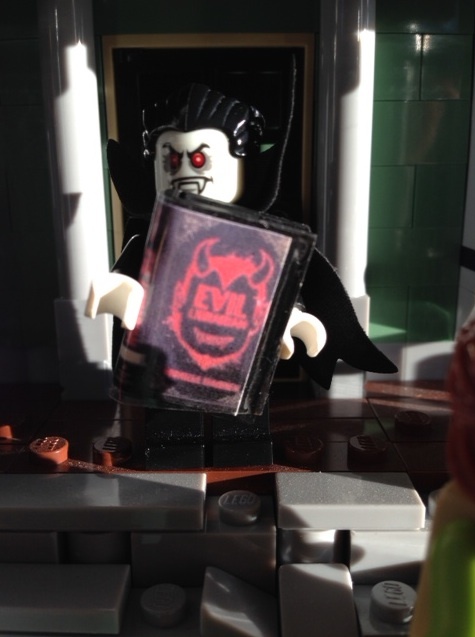 Recommended by demons, vampires, and villains everywhere! 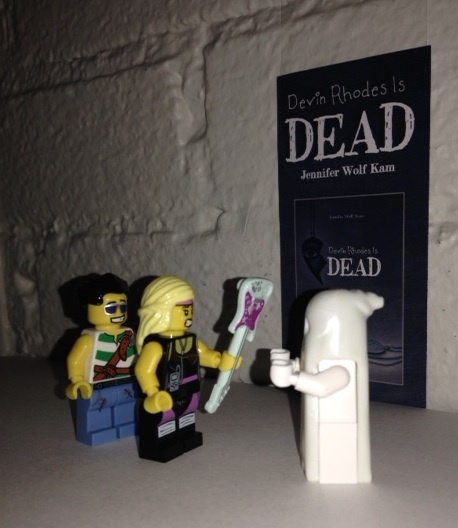 Despite the lack of trick-or-treaters, I celebrated Halloween in fine style via Lego book launches for two scary YA titles — Michelle Knudsen’s Evil Librarian and Jennifer Wolf Kam’s Devin Rhodes Is Dead. 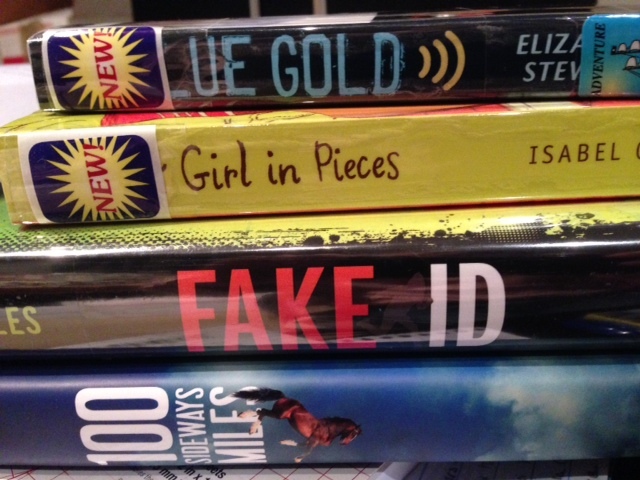 I took different approaches with each of these books. For Mikki’s (as I knew Michelle from my days in the MFA program at Vermont College of Fine Arts), I focused on the librarian himself, a dreamy-looking demon who captures the souls of students at the high school where he plies his trade. Here, he’s pushing his book on an unsuspecting girl. For Devin Rhodes Is Dead, I dramatized a scene in the novel, but with a humorous twist as the Lego ghost is far from scary. Here, main character Cass, a talented guitarist, is fending off the ghost of the former friend,who she thinks she betrayed, while also defending love interest Marcus from ghostly Devin. My Lego scenes have offered a welcome break from Cybils reading. The bloggers have made me work as I asked them to do. The YA Fiction category, for which I’m a panelist, has 180 nominations. 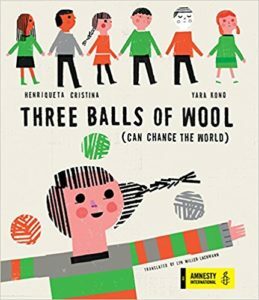 I have read 31 books so far and have until the end of December to read the rest — or as many as I can find. Time to pour a cup of coffee, tear open a bite-size Snickers bar or two, and get back to reading. 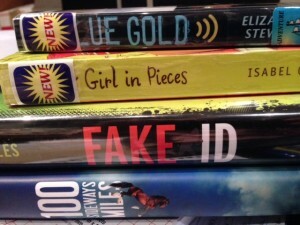 Some of my recent Cybils reads.